What's your distribution (Ubuntu I guess) and its version? And what's the version of the dock? The placement of these menus should be handled by GTK. I suspect a bug with it. 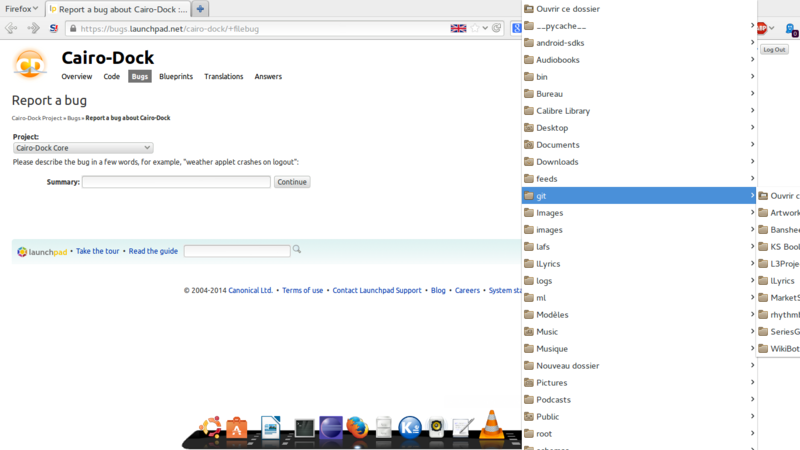 I think there were a bug with the previous versions of GTK3. Are you using GTK 3.10 from GNOME ppa? actually on the correct size. > Are you using GTK 3.10 from GNOME ppa? I'm using Gnome Shell version 3.8.4. I tested with beta version and the bug still there. @fabounet: so,.. for you this bug is due to GTK? @Megamo: thank you for having tested our beta version! sub-menus not expanding vertically as they should. > @fabounet: so,.. for you this bug is due to GTK? > sub-menus not expanding vertically as they should. >> Dock Devs, which is subscribed to Cairo-Dock Core. But I think we already add a workaround for that. I think I added one line to force the reposition of the menu. size of he sub-menu are wrong. so at least, we need a way to tell the menu it should reconfigure itself. >> sub-menus not expanding vertically as they should. >> @fabounet: so,.. for you this bug is due to GTK? >>> Dock Devs, which is subscribed to Cairo-Dock Core. line to force the reposition of the menu." -1);" instead seems to force the menu to re-compute its internal size. > -1);" instead seems to force the menu to re-compute its internal size. > > -1);" instead seems to force the menu to re-compute its internal size.